Instead, you could control all three security features from your smartphone or tablet with the Maximus Craftsman Smart Security Light. Designed to provide peace of mind, this light, by Jiawei Technology, is an all-in-one outdoor, waterproof, lantern-style light. It’s as easy to install as an ordinary light fixture, but with a cloud-based app by Kuna, it’s anything but ordinary. Security features include an adjustable 720p HD video camera with a 116-degree field-of-view that’s housed inconspicuously near the bottom of the wall mount. There’s also a hidden built-in speaker and a microphone to capture audio. The beauty of this system is that all of its features come together just as events happen in real-time. Say someone approaches your door. Maximus’s motion sensor is triggered, the light can be configured to turn on and an alert signal is sent to your smartphone. From your phone, you can view who’s at the door and engage in a two-way conversation by pushing the mic button on your app. Or you can choose to play a pre-recorded message or greeting. Or, in rare cases, you can sound the 100-decibel alarm (louder than a motorcycle), capture an image and scare away those Amazon package thieves. Or you can have your phone dial 911. All this and more can be configured to execute automatically or as you want. events and quickly look back for up two hours without a subscription. This can be done whether you’re on the other side of the door or on other side of the world sipping margaritas on the beach – no one would be the wiser. In fact, when you’re away, you can monitor a live stream to check the weather outside your front door and see or if your walk needs shovelling. You can also configure the lights to turn on or off at a specific time – say sunrise or dusk in your area – or on when it detects motion. And you can program a separate weekend schedule for lights. As well, you can give permission for someone else, like a neighbour or family member, to monitor your system. Simply install the app without allowing full administrative access. Motion alerts can also be handy. Let’s say a courier shows up and you’re at work or on vacation. Instead of them leaving a card or trying to come back another day, just talk to them and make arrangements. 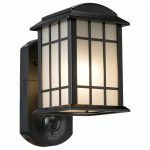 The Maximus Craftsman Smart Security Light is as easy to install as an ordinary light fixture. It requires a Bluetooth-enabled iOS or an Android mobile device, as well as a Wi-Fi or data connection. To configure your Maximus, download the app and set up a free Kuna account. It retails in Canada for $279.99 and is available at Amazon, Best Buy and Home Depot. Greg Gazin, also known as The Gadget Guy and Gadget Greg, is a syndicated veteran tech columnist, small business and technology speaker, blogger, podcaster and author. Reach him @gadgetgreg or at GadgetGuy.ca. This article appears at Troy Media and syndicated sites. A version of this article also appears in Active-Life Magazine in print and on-line.